Sometimes you need to read font properties like font size, font color, font family, font background color etc.. during WebDriver test case execution. Selenium WebDriver Is very wast API and It has many built In methods to perform very small small operations on web page. Reading font property manually Is very simple task using firebug as shown In bellow given Image. If you wants to read above shown font property In selenium webdriver then you can do It using .getCssValue() Method. You can provide property name (Example : font-family, font-size, font-weight, etc.) with .getCssValue() method to read Its value. READ MORE TUTORIALS on selenium WebDriver. 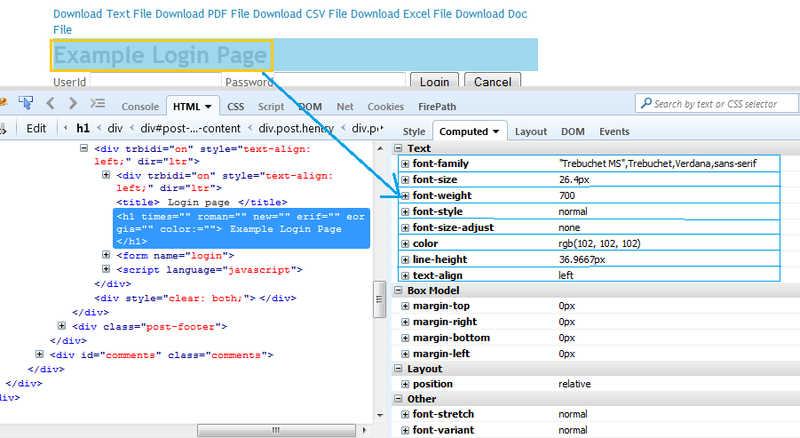 Bellow given example will read values of font-size, color, font-family and text-align properties of "Example Login Page" text. //Locate text string element to read It's font properties. //Read font-size property and print It In console. //Read color property and print It In console. //Read font-family property and print It In console. //Read text-align property and print It In console. Output of above example Is as bellow. You can use .getCssValue() method to get any other property value of any element.